FAIRVIEW is all about its amazing location. Close to the water with a gorgeous, unobstructed westerly view, this cottage is in a peaceful out-of-town spot on Barter’s Island. Only 2.5 miles from the Coastal Maine Botanical Garden, closer still to Porter Preserve, Fairview is an easy drive to grocery stores and local farmers markets. 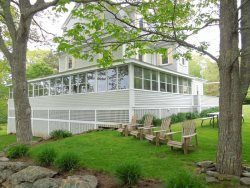 This cottage is only minutes away from Boothbay Harbor restaurants and shops as well as Southport's Hendrick's Head Beach. The owners of A Fairview love having their morning coffee or evening cocktail on the screened porch or on the dock. From there you can watch the waterfowl while the tide ebbs and flows. They are kayakers and love launching right from the house. Guests can also easily launch from nearby Knickerkane Landing if they wish to explore a whole different part of the coastline and Sheepscot River. Whether you rent kayaks locally or bring your own, you will love this kayaker's delight! Away from city lights, stargazing is unforgettable. This cottage comes with a telescope for your use. This cottage is large enough to sleep six but small enough to be cozy for couples, and easy to care for. Like most salt-water tidal rivers, the aquatic life is bountiful around Barters Island. You will enjoy bird-watching even if that is not your norm! Expect to see egrets, herons, loons, osprey, eagles and more. Also seals, porpoise and otters have been known to frequent the area! Wave the Lobstermen in from your dock and share in the local bounty! Did you say lobster for dinner? Of course, you can get out in the water yourself! Sailing, kayaking, rowing and more are easy to do from your dock. Several local vendors can help outfit you with the boats, guides, etc for a fantastic aquatic adventure leaving daily from your own dock! Fairview has lots of windows, throw them open and enjoy the incredible Maine light and fresh, salty air! Did we mention the incredible sunset views from the living room, master bedroom, and porch? The look and feel of this cottage are clean and comfortable and has been freshly painted with not even a hint of fussiness! The main floor entrance lets into the family room with a flat-screen TV and comfortable furnishings. From there you can pass into the open living/dining room with the wall of windows and the incredible views! The updated kitchen and summer dining on the screen porch make it fun to cook in or bring home some famous lobster rolls from the nearby Trevett Country Store. Two bedrooms (one Queen, one with two Twins) and two full baths complete this floor. From the second floor retreat to the Master Bedroom with a Queen Bed and en-suite bath. Relax curled up with a good book while enjoying the view; wake to the sounds of nature and lobster boats beginning a busy day. LINENS & TOWELS INCLUDED? No, linens and towels are not provided for your stay, however, they can be rented through us for $45 per bedroom, or you may bring your own. The Boothbay Peninsula is a beautiful region rich in culture, history, all things nautical and of course it’s own unique niche in nature. The area offers ample opportunities for biking, kayaking, canoeing, fishing, charters, and guided cruises, spas, a championship golf course and country club, mini-golf, bowling, museums, antiquing, hiking and walking trails. We have the Maine State Aquarium, the Coastal Maine Botanical Gardens and the Boothbay Region Land Trust with its 30+ miles of pet-friendly trails in protected areas. For a more comprehensive list of local offerings Click Here! Always a pleasure to chat with all the staff. And always grateful to Lucy for connecting us with Fairview. We've stayed at Fairview 3 times now. Love the property. So comfortable, quiet, well maintained. Lovely views. Melba spent a fair bit of time with us helping us choose another property for 2016. We really appreciated her time, her knowledge and her willingness to work with us! 2015 was the second year we rented from CC and we are extremely pleased with their offerings and the wealth of details and photos of each house on their web site. The house we rented in 2015 was spacious, quiet and with a lovely view overlooking the Sheepscot River. Sunsets were gorgeous and we loved the big windows and the screened porch! Cottage Connection folks know their properties and are are very good at determining which particular property would be a good fit for you. When a cottage rented directly from an owner fell through, I was pretty sure Cottage Connection would be able to help us. And Lucy did exactly that, finding us a perfect rental. We liked it so much, we stayed longer than we planned and returned the following year. We're loyal fans of Cottage Connection. Lovely, relaxing getaway. With Cottage Connection, we know that the properties will be well maintained and managed. And if there is a problem with anything, there is someone to attend to it. Love relaxing by the water, and delighted that there was so much firewood available. Enjoyed a fire almost every night. Delightful cottage and location. When asked if Charles would recommend Cottage Connection of Maine to family and friends, he commented "Cottage connection makes for a hassle free vacation, great friendly staff. I chose Fairview on Lucy's (reservation agent) recommendation. Renting from Cottage Connection was a smooth painless transaction from start to finish"
What did the Hopkins find to be the best part of their vacation? "The house (Fairview) was awesome, best equipped house we have ever rented" and their biggest surprise of their stay? "The house in general, outstanding view, great fire pit with plenty of good dry wood for evening fires. The kitchen was equipped beyond any expectations". The Hopkins recommends to the homeowners "keep up the good work & you have a beautiful home". We have been renting cottages in the Boothbay area for 15 years and Fairview has by far been the most comfortable and charming one. Thank you for sharing this lovely home with us. We had a lovely time at Fairview! Thank you for being dog-friendly and for keeping a well stocked kitchen. My family enjoyed the screened in porch as well the fire pit on one cool evening. Our dog, Ghost, loved exploring the shore and swimming in the river. He learned how to water retrieve off the dock! I hope we can come back next year. What a perfect week. We so enjoyed our week at Fairview - especially the wonderful water views. We appreciate the quiet setting and yet the proximity to so many great locales - Damariscotta, Pemaquid Beach, Southport, Wiscasset and more. The house is perfect for my family and we look forward to returning in the future. Your place grew on us. We had a great time. We love it here! Especially the peaceful environment, so calm and calming. Thank you for the vacation and the nice memories. Swimming Area Rating 3/5: Somewhat easy water access with a rocky shoreline, or rocky bottom, not suitable for young children, but fine for older children/adults, water shoes recommended.